On February 8, 2018 in Zankel Hall, it’s Nico Muhly and Friends Investigate the Glass Archive, which will have Nico reimagining some of Glass’s lesser known music with an ensemble that includes Laurie Anderson and more (tickets). The Philip Glass Ensemble performs Music With Changing Parts at the Perelman Stage/Stern Auditorium on February 16, 2018 (tickets). Experimental drumming ensemble So Percussion teams with the JACK Quartet for an evening of premieres, including one by Glass, on March 6, 2018 in Zankel Hall (tickets). More info and tickets for all shows here. Full schedule and an announcement video, below. 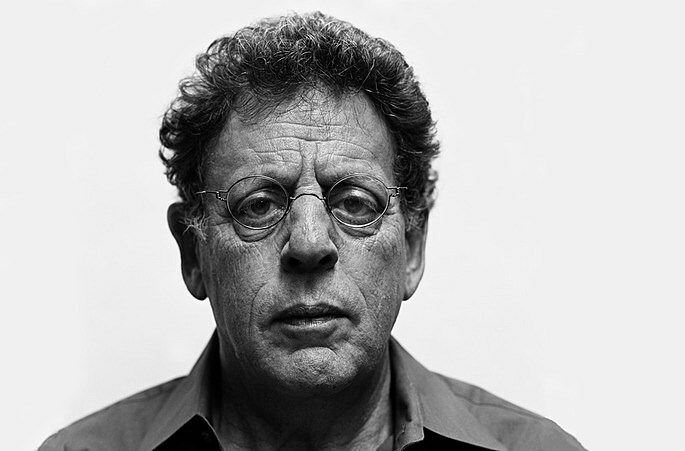 Not at Carnegie Hall but the Philip Glass Ensemble will be performing Glass’ interpretation of Jean Cocteau’s masterpiece La Belle et la Bête at Town Hall on April 20 as part of the Tribeca Film Festival. Tickets are on sale. In other Philip Glass news, the lineup has been expanded for the 2017 Tibet House US benefit, which Glass is the artistic director of. The new additions are blues rockers Alabama Shakes and singer/songwriter Ben Harper, and they join Sufjan Stevens, Iggy Pop, Patty Smith, Laurie Anderson, and New Order members Bernard Sumner, Phil Cunningham and Tom Chapman (among others). The concert happens March 16 at Carnegie Hall. Tickets are still available. Updated liineup below.